From new features to recent enhancements, here’s the rundown on what’s new at SAP Conversational AI. Game changer! It’s now easier than ever to manage roles and permissions across your team of bot builders. If you are the administrator of an organization account, you can now assign one of the following base permissions to all members of the organization. This base permission is applied to all bots within the organization. Now let’s put this into practice! Improve your bot’s understanding and provide a better confidence score when an intent is detected with our new classifier! Try it by switching to the new algorithm in your bot’s settings today!  Introducing the new SAP Conversational AI website. Get the most out of our platform now! 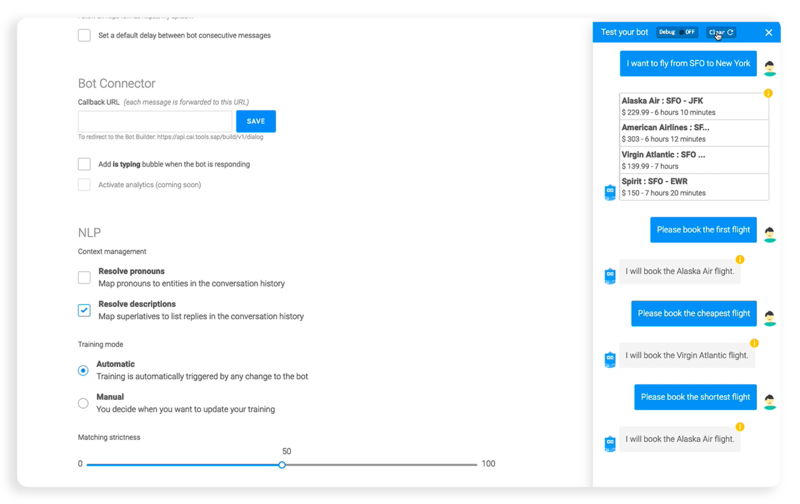 SAP Conversational AI, formerly known as Recast.AI, has had a make-over! In our journey to join the SAP portfolio following our acquisition in Jan 2018, reworking our branding was essential. Now, our website better reflects our recent integration into the Machine Learning product portfolio of SAP. However, it doesn’t change anything for you. The platform continues to run, and you can still access, build and use bots for free. If you need any clarification, please reach out to us at  justine.baron@sap.com. Improve significantly the accuracy of your bot with superlatives! From now, when a user is conversing with your bot in English, French, or Spanish, and it replies with a list, carousel, quick reply, or buttons, the user can now refer to an item in the message using a superlative or ordinal like “cheapest”, “most expensive“, ““first” or “last”. For example, if the bot displays a list of flights, the user can tell the bot to book the cheapest or the shortest one. Very helpful! Make your bot messages more readable! When creating text messages or quick replies on the Actions tab or Requirements tab of a skill, you can now opt to use markdown to format text as bold, italics, or as a hyperlink. For a preview of how your text message or quick reply will be rendered, simply save it. Get meaningful insights from your users data, wherever you are! Set your time zone in your users settings, and use it in all the filters of log feed, usage metrics and training analytics.  You need to verify your email address by March 2019 to continue to use the platform. You can easily do this in your settings. We urge you to take care of this as soon as possible so that you can continue to build bots smoothly. ✨ On the Train tab, entities now load faster! ✨ When you click a custom entity, you’ll see a list of the values that you added as synonyms, and you’ll see separately the values tagged in your intents. This helps you to clearly distinguish the two. You can see the complete changelog here and stay tuned by following our blog or contact us on Slack!